Agapetes (Ericaceae; blueberry tribe) is distributed from the eastern Himalaya through southwestern China and Indochina to Southeast Asia and comprises about 80 species. During recent China-Myanmar joint field expeditions to survey plant diversity in northern Myanmar, researcher from Xishuangbanna Tropical Botanical Garden (XTBG) collected several specimens of an interesting Agapetes with almost fleshy branchlets and stout pedicels around Putao, Kachin State. After examining the morphological and anatomical characters in detail of the specimens and closely related species, the researchers confirmed that the species is new to science. They named it as Agapetes brevipedicellata and got the new species published in Phytotaxa. Agapetes brevipedicellata is similar to Agapetes pseudogriffithii with stout, fleshy, apically cupuliform pedicels, but differs from the latter. It has nearly fleshy branchlets, linear-lanceolate leaves, stout, fleshy, bracteate peduncles, and pale greenish pedicels and calyx tinged with pale pink, and stems and branchlets with prominent leaf and inflorescence scars. The species epithet refers to its stout, fleshy and short (about 1 cm) pedicels. 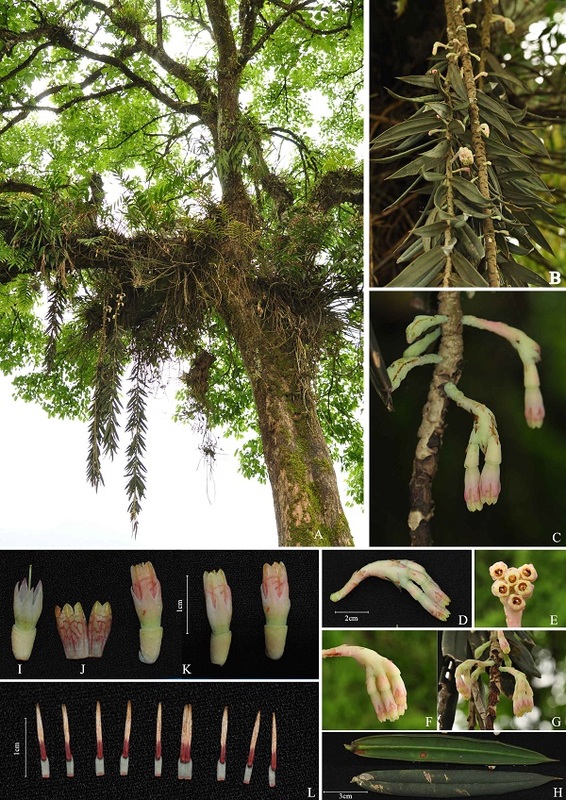 This new species is known from Upper Shankhaung village, Putao District, Kachin State, where it grows epiphytically on the canopy trees of tropical lower montane rain forests at an elevation of about 400–600 m. It flowers from April to June. Agapetes brevipedicellata Y. H. Tan & S.S. Zhou. A–B. Habit. C. Flowering branchlet. D. Inflorescence. E. Inflorescence with flowers in apical view. G. Inflorescence with flowers in lateral view. H. Leaves showing abaxial and adaxial surfaces. I. Flowers showing pedicel, calyx and style. J. Corolla opened to show outer surface. K. Flowers showing pedicel, calyx and corolla. L. Stamens.